Day 3 in Nevada had me hiking in the Schell Creek Range, NE of Ely. I had been to the range two years earlier, tagging North Schell, the range highpoint and a P5K, and some others. I had gotten within a mile and a half of South Schell, but left it for a future hike so I could add some others nearby that I didn't have time for on that first visit. There are two other 11,000-footers, one of which is a P900. With temps in Ely hovering around 95F, I wanted to spend some time at higher elevations to avoid the heat. I had driven in on Forest Road 424 the night before, camping around 9,000ft where it was 68F when I went to bed around 10:15p. I had to leave the windows down for the night to let it cool off inside - it's amazing how much residual heat builds up inside when it's this hot out. Everything had cooled nicely by morning with temps around 55F. It would be 77F when I returned after noon, but most of the day had cool temps at the higher elevations above 10,000ft where I spent most of the morning. I was awake around 5:30a, moving the jeep up the road a bit to the Wilderness boundary at 9,400ft. There are some buildings here, part of a ranching concern that grazes cattle and sheep in the Bery Creek drainage. 2WD vehicles can drive the first 5mi of FR424 to the Berry Creek Campground, but after that the road gets rough for the last three miles and high-clearance is needed. I started up the Berry Creek Trail on foot, following the trail towards an old prospect on the northeast side of Peak 10,803ft. There is a nice campsite with a picnic bench in the woods along the way and the trail is generally easy to follow. After a mile and a half I seemed to lose the trail, so I headed up directly to the first peak cross-country, less than a quarter mile to the southwest. Once on the summit, views open up across the range and well beyond. It would grow hazy again soon, but in the early morning the lighting was still quite nice. I turned east to begin following the ridgeline where I would stay above 10,000ft for the next five hours. None of the cross-country was difficult, though there is much talus, some of it loose and mildly annoying. For the most part, the hike is extremely pleasant, class 1 for more than 90% of it, with fine views off one side or . After a mile and half, I turned north on the main crest, making my way to the summit of Peak 11,368ft, and then 2mi further north to South Schell Peak. I found a cairn at both summits, but only South Schell had a register, left by an LVMC party (South Schell is on their peak list). Interestingly, South Schell isn't the highest of the day's peaks, that honor goes to unnamed Peak 11,768ft about a mile and a half to the southeast on a spur ridgeline, only a few feet higher. There is a drop of more than 900ft between the two, and it was necessary to traverse it in both directions, a tiring affair after already doing more than 3,000ft of gain. The route between the two had the most talus and loose rock of the whole day, requiring extra time and effort to negotiate. I found no register on the last summit, so left one of my own since a P900 seemed decidedly worthy of one. After taking a longish break at the summit, I retraced most of my route back up to South Schell, bypassing the highpoint to the south. 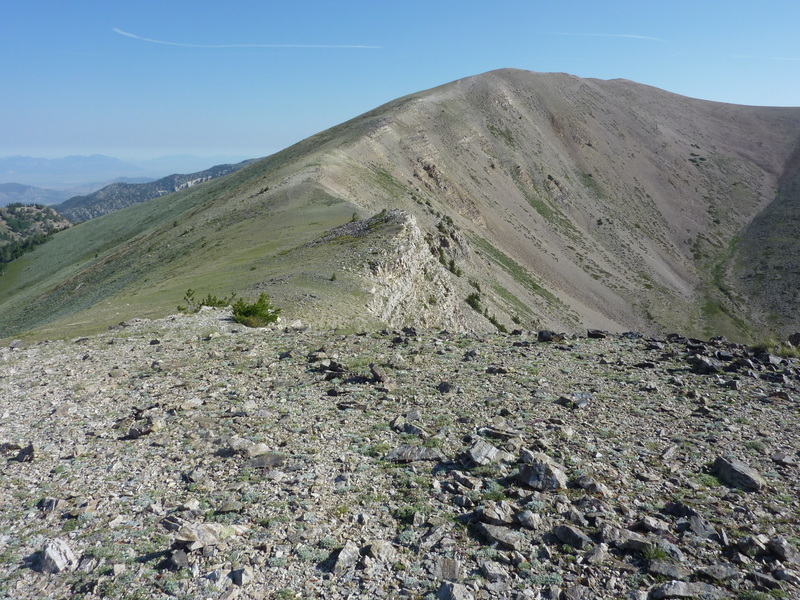 I descended South Schell's SE Ridge to the first saddle, then began a descending traverse from the crest. This took me through fields of lupine and sagebrush, and down through a mature aspen forest that was far easier to negotiate than the typical Sierra aspen grove, twisted and gnarled from avalanches.